Having suffered from a rather unproductive creative lull recently, I actually managed to make something this week. Hooray! A combination of working weekends, a messy house and trying to maintain a social life have meant that I just haven’t made much lately. Don’t you agree that having a messy home just saps all your creativity? So to that effect, I’ve been having a clear out and trying to sell what I can on eBay or Etsy. This week’s challenge was Art and I was inspired by Vincent Van Gogh and the impressionist painters’ brush strokes. This is the same dress as the ‘Made this Look’ dress and it’s a very easy dress to make. 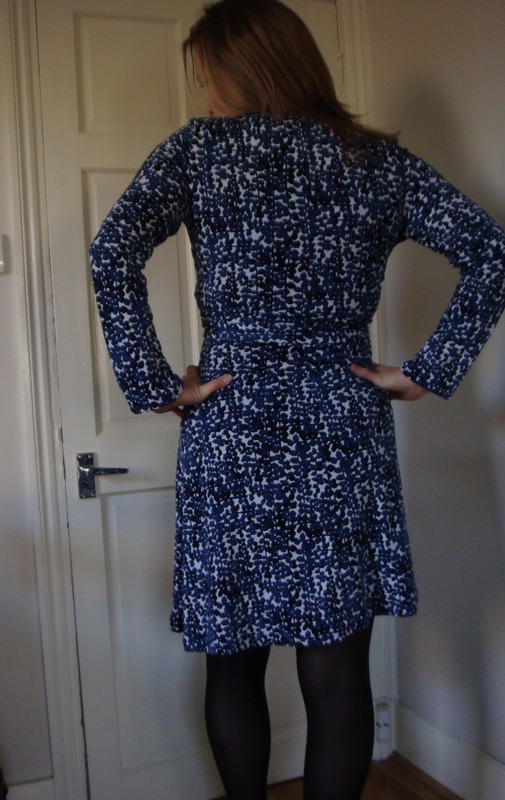 This knit isn’t the greatest and I think it hasn’t got as much elasticity as the last knit that I used – this dress would have been better if I had used a size or two smaller. Instead I trimmed about 5/8″ off each side seam and took up the hem 2 inches. The arms are a little baggy and the bust gapes a lot more than the dress made from viscose jersey. Once i’ve put a little modesty preserving stitch on the gaping bust, it will be a great casual but formal dress, perfect for work!